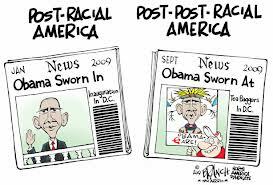 Even before President Obama was elected, much of American society was declaring ourselves 'post-racial.' The country seemed so much better than it was in the Jim Crow era. Surely we had reached a point where race no longer mattered! This was a dangerous, head-in-the-sand mentality that ignored the realities of a highly racialized society. One in which racism had evolved from an era of overt segregation and discrimination to one that was more sneaky and covert. Racism survived and thrived by staying under the radar. More difficult to point a finger at, easier to ignore. In this way, racism permeated hearts and minds often undetected, and therefore unchecked. This was the colorblind era of racism. While we declared 'equal opportunity' we declined job applicants that "didn't fit the company atmosphere." While we abolished redlining, we targeted sub-prime mortgages to those who "seemed higher risk." While we proclaimed peace and harmony, we arrested anyone that "fit the profile." But we didn't see race. Or perhaps we are entering a new era. Bloggers writing their think-pieces. Churches hosting awkward talk-back sessions. Schools organizing public forums. Companies releasing public statements. Perhaps we are now moving into a post-post-racial society. And I'm not entirely sure what that means. It might not be any better. Racism has a vile way of evolving with its surroundings to perpetuate its own survival. What would that look like in a post-post-racial society? Most recently, explicit bias has made comeback. We've observed a resurgence in overt fear and hate in ways we largely haven't seen since the Civil Rights Movement. If we’re not careful, this dynamic will lower the bar for racial progress, and allow well-meaning individuals to rest in the comfort of knowing that at least we’re not like those ‘bad apples.’ But let us not be lured into thinking explicit racism is its only form. Instead, we must continue to uncover and counteract our own implicit biases, understanding the profound role they play in perpetuating systemic injustice around us. If we have indeed begun a 'national conversation on race' will it be helpful? Will we really be able to talk our way out our country's corporate sins? Will hearts change or simply be hardened? Our society has been racially aware before. Are we capable of doing it better this time? Or maybe we're still living the same colorblind story. Maybe in a month or two, we will all return to our cultural slumber, having learned nothing from the past years. Maybe we will double down on our notion of being post-racial, wanting to believe so badly in the lie. So, what might a post-post-racial consciousness in the United States look like? Or has colorblindness-era not fully played itself out yet in this country? Can we predict the next strategy that racism will use as it evolves? 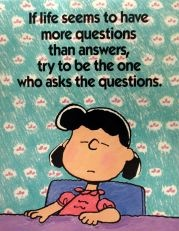 In short, I pose the questions to my readers: what's next?